Four officers were in critical condition and a suspect dead on Saturday after two related shootings, the first after a traffic stop and the second after a massive manhunt ended in gunfire, police said. Two officers were shot in the first incident just after 1 p.m. after they stopped the suspect's vehicle in east Oakland, said Oakland police spokesman Jeff Thomason. The suspect fled the scene on foot into a nearby neighborhood, police said, leading to an intense manhunt by dozens of Oakland police, California Highway Patrol officers and Alameda County sheriff deputies. Streets were roped off and an entire area of east Oakland closed to traffic. At about 3:30 p.m. officers, acting on an anonymous tip, found the suspect, who had barricaded himself in a building close to location of the first shooting. Gunfire was exchanged between the two parties, injuring two more officers and killing one of the suspects, reports CBS Station KPIX in San Francisco. "We had SWAT officers go into that building and that's where the second shooting took place," said Thomason. All four officers are in critical condition at Highland Hospital, Thomason said. Dozens of people, including other officers gathered outside the hospital, awaiting word of the officers' condition. Authorities say the Alameda County coroner has been called to Highland Hospital in Oakland in response to the shooting but the hospital is not releasing any information yet, KPIX reports. A visibly shaken acting Oakland Police Chief Howard Jordan said the department was still investigating. "At this point we don't believe there are other people involved, but it's too early to tell," he said. Tension between police and the community has risen steadily since the fatal shooting of unarmed 22-year-old Oscar Grant by a transit police officer on Jan. 1. That officer, Johannes Mehserle, has pleaded not guilty to a murder charge. A preliminary hearing is scheduled for Monday. Violent protests erupted on the streets of Oakland in the weeks after Grant's death, further inflaming tensions. Hours after Saturday's shootings near a busy intersection just blocks from a police substation in east Oakland, people were still at the scene of the first shooting as police tape blocked off streets. Mo Wiley, 32, of Oakland, said emotions still are raw from the Grant shooting. "Oakland is a beautiful place," Wiley said. "But I just hate when it gets ugly like this." Meanwhile about 20 people taunted police near the scene of the first shooting, saying the incidents were "payback for Oscar." 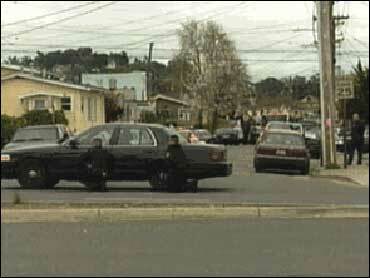 The mood was somber outside the police station in east Oakland as the investigation continued. Officers hugged and consoled each other. "This is a highly sensitive situation that we're dealing with right now with our OPD family, and we're still trying to notify family members that their family members were hurt," Thomason said.